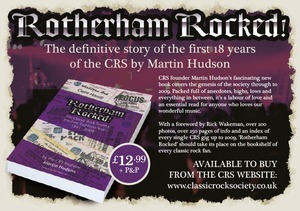 In 2009 Classic Rock Society founder Martin Hudson decided he had taken the CRS as far as he could. He co-founded the CRS back in 1991 with a meeting of classic rock fans at the Florence Nightingale pub on Moorgate Road, Rotherham. From this came a fanzine that evolved in to an A4 sized colour glossy magazine that has included interviews with many of the world’s great rock names. The magazine continues to this day. One such interview back in 1992 saw Martin ask world renowned rock keyboards player, Rick Wakeman, if he would become the CRS’ Honorary President to which he readily agreed. He has been part of the CRS ever since. Other famous rock names followed by adding their names as Patrons, including Genesis guitarist Steve Hackett, rock DJ Bob Harris and other rock luminaries such as Rod Argent, Colin Blunstone, Fish, Gordon Giltrap, Dave Greenslade, Roger Hodgson, CarlPalmer, Dave Pegg, Dave Cousins and John Wetton. There was also that first ever concert at the Florence Nightingale when the CRS filled the venue and then went on to organise 350 concerts in the next 18 years. Those concerts continue, although in much lesser numbers and not all in Rotherham, sadly. Those concerts included visits to ‘little’ Rotherham by Rick Wakeman and the English Rock Ensemble, Steve Hackett and his band, Focus, Glenn Tilbrook, Magnum, ex-members of Whitesnake and Bad Company, Springsteen guitarist Nils Lofgren, It Bites, TheGroundhogs, Climax Blues Band, Judie Tzuke, Sam Brown, members of Supertramp and a whole host of big name progressive rock bands from the UK and countries such as the USA, Japan, Brazil, Argentina, Mexico, Holland, Italy, Sweden, Norway, France, Belgium, Germany and others. One such band with a big reputation today is Californian band Spock’s Beard and their first ever UK show was for the CRS in Rotherham. Sadly, Rotherham never had the perfect live music venue for the CRS and so most were held at the now demolished Herringthorpe Leisure Centre, quite a few in the top hall at Oakwood School (renamed by the CRS the Oakwood Centre), some at the Montgomery Hall at Wath Upon Dearne (some are still done there) and smaller places after the Florence such as Rotherham Rugby Club and some pubs in town. The Classic Rock Society was always up against it while trying to establish itself in Rotherham, but with the help of an army of volunteers managed to create a global business that brought rock fans to Rotherham, bringing business to the towns hotels etc..
Asia frontman and voice to such hits as ‘Heat Of The Moment’ once said that it was the Classic Rock Society that put Rotherham on the musical map while Rick Wakeman said that it was the Classic Rock Society that kick-started the progressive rock revival. It is a lot healthier today than it was back in 1991 when Martin Hudson and a group of friends started things off. Martin Hudson’s book has been encouraged by some well-known musicians such as Carl Palmer of Emerson Lake & Palmer and a host of CRS followers. It has been three years in the writing and tells why it happened and how it grew. 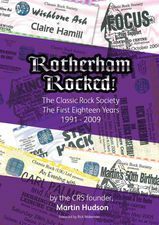 Lots of anecdotes about the concerts, the interviews and how Rotherham became recognised in classic rock circles. All profits from the book will go to Rotherham Hospice. We now know the costs of P&P. Not cheap because the book is an inch thick.